Cupping therapy in Dublin/Upper Arlington and Pickerington. Cupping therapy is a massage technique that utilizes small bulbous cups that are moved lightly across the customer’s body. Practitioner claim cupping is generally is used against “cold energy” in the client’s meridians. The warmth produced by the cupping technique stimulates the skin, thus attracting blood to the afflicted area to promote healing. As the chi is warmed, it starts to flow freely down the meridians. Past cases have shown this technique is effective against a number of maladies. Today, cupping is still used for digestive and gynecological disorders, as well as respiratory disease, lymphatic blockages, and headaches and dizziness. Cupping can help in speeding up the healing process against the common cold, and it is a remedy against insomnia and soft tissue injuries. Comfort and relaxation are always important factors in the healing process for “alternative medicine.” Stress tends to tense muscles, which inhibits blood flow. Bringing a customer to a state of relaxation frees the body to use its own natural curative resources. When you first enter Sean’s Massage Center, our staff strives immerse you into an atmosphere of comfort before they start addressing what ails you. Soothing background music helps build up the ambience of relaxation and healing. In all service, Aveda oil is used as you lie on a warm table and fell your tensions ease under the hands of our expert practitioner. Sean McGrath and other staff members of Sean’s Massage Center are trained in a variety of techniques which are part of the OSU health benefits. Some of Sean’s specialties can be used in coordination with cupping, such as Swedish massages, reflexology, couples massages, prenatal massages, and others. Using multiple techniques is very effective in getting rid of the client’s discomfort, and even speeding up the healing process. For expectant mothers, comfort is a primary issue, so we use a specially designed table for pregnant women, which provides a new level of comfort throughout their term. Emotional distress and physical discomfort are part and parcel to pregnancy. 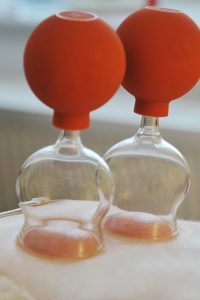 Cupping can be used with other prenatal massage techniques (such as the Swedish massage) and can help alleviate some of the joint pains as well as respirational and digestive issues. Every part of your body is in some way “wired up” to the hands and (especially) the feet, according to reflexology experts. Whether combined with cupping or not, this is a proven technique, effective in relieving stress-related maladies and other conditions, such as allergies, headaches and depression. Reflexology has far-reaching results in dealing with nervousness because it addresses the natural balance of the entire body, much more through than a regular massage. By stimulating certain pressure points – called nerve zones – the skilled practitioner will bring about positive effect in a corresponding region or function in the human body. The Swedish massage was developed in the latter 18th century by Per Henrik Ling, a Swedish native whose innovative physical therapy was introduced to America in the mid-19th century. Ling’s innovative technique was based on Euro-American medical knowledge of human physiology. This technique uses light strokes with light to medium pressure which effectively eases muscle tension and stress. When administered by a professional it will encourage blood flow (therefore, oxygen flow) to encourage healing and allow the release of endorphins. If you are not sure if cupping or some other technique, or combination of forms is what you need consult with Sean McGrath or one of his practitioners. For more information, click on the “Services” page of the Sean’s Massage Center website. We can give relief to your aching body. Sean received his Massage Therapy License in January of 1998. After leaving the Central Ohio School of Massage in Columbus, completed a 670-hour series of courses in anatomy, physiology, and hygiene. Now, he is a proud member of The National Honor Society and The American Massage Therapy Association (AMTA).